Yesterday afternoon, I arrived in Tokyo to begin the first official step toward the #100Summits Project: filing my visa application. Japanese residence visas can be difficult to obtain, but I’m hopeful my plans to climb the hyakumeizan and my publishing contract for 100 SUMMITS–a nonfiction book about my quest to scale Japan’s most famous peaks in a single year–will be sufficient for me to obtain a one-year visa. 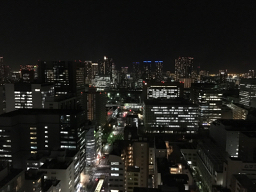 I’m currently staying in Ginza – a portion of Tokyo named for the silver mint built here during the early 17th century (during the Edo period). Today, Ginza is famous for its upscale shops, restaurants, and department stores. 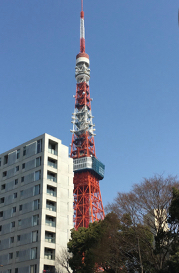 (We can see Swarovski, as well as the Tokyo Tower, from our hotel.) I’m not much of a shopper, even when I’m not on chemo, but Ginza is close to my immigration representative’s office, which made it an easy choice. 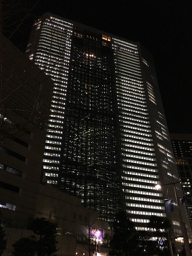 And Ginza’s many office towers glow like diamonds in the evening–largely because of the late working hours common to many of the people who work in Ginza and the surrounding area (including my son, whose office is only a few miles away). I won’t get out as much as usual during this trip. My oncologist wants me to avoid crowds and take precautions to try and stay healthy while chemo has my immune system compromised. Even so, I’m cleared for walks and planning to have a little outdoor fun in the next few days – which I’ll share with you as I go!